This entry was posted on November 12, 2012 by David Joseph. It was filed under Graphic Novel/Comics, Reviews and was tagged with Book Review, Cthulhu, Cthulhu Mythos, Dan Lockwood, Graphic Anthology, Graphic Novel, H.P. Lovecraft, Horror, I.N.J. Culbard, Self Made Hero, The Lovecraft Anthology. – I disagree with “The Haunter of the Dark” statement. I’m sorry, but I like the style of the art. The color scheme was also very effective. The depiction of Nyarlathotep himself was not faithful, but still quite satisfying. 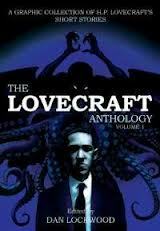 – “The Dunwich Horror” was not one of the collection’s strong points, I agree. I was particularly dissatisfied with the depiction of Wilbur Whateley’s corpse. HOWEVER, I found that Wilbur’s twin was done fairly well. It seemed clear that Culbard had some idea of what Yog-Sothoth is depicted as. – Just so you know – in “The Call of Cthulhu,” there’s a panel where the sailors are swallowed up by R’lyeh in an admirable optical illusion. Well, on some of the runes are in English, and they read “AFTER MC ESCHER.” See if you can find this little Easter egg from D’Isralei! I totally agree with the rest of the review. “The Rats in the Walls” does not have a good adaptation, particularly in the underground city. I was left almost baffled. But the art (it IS like Disney! I’d go to see that film!) is very well done. I loved this review and I love the book. I’ll definitely be checking out the second volume. Thanks for the comment, Black Pharaoh, I am happy you enjoyed the review. I recently reviewed Volume 2 a few months ago and found myself reflecting on the thoughts I had on the first volume. After a year of revisiting Volume 1, I found myself having some differing opinions with my previous statements. Though I will keep them as is, I do mention a couple discrepancies I share with my own review.